The latest film from the great Steven Spielberg is “Bridge of Spies,” a drama based on true events, set in the Cold War era. 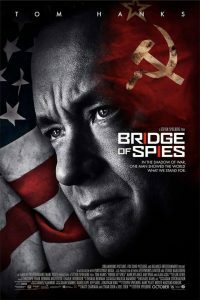 “Bridge of Spies” tells the story of Soviet spy Rudolf Abel (Mark Rylance), who is captured by the FBI in Brooklyn in 1957. In an odd but true turn of events, James Donovan (Tom Hanks), a lawyer specializing in insurance cases, is asked by the government to defend Abel. It seems that the FBI wants Abel’s legal right to a trial to be upheld. However, in the height of the Cold War, everyone considers Abel guilty and doesn’t want his legal representation to be too good. Donovan takes his job seriously and, to the chagrin of many, fights for the legal rights of his client. Donovan is reviled for his work on behalf of Abel, and his family is even threatened. No one can understand why he works so hard for a representative of our mortal enemy, the Soviet Union. The situation becomes worse when Abel is sentenced to 30 years in prison, rather than execution, which many Americans wanted. Meanwhile American pilot Francis Gary Powers was shot down over the Soviet Union while flying a surveillance plane on a top secret mission. He was captured by the Soviets. Spielberg does a great job cutting back and forth between the stories of Abel and Powers. Donovan is relieved when Abel has been sentenced and the publicity has died down. He is eager to return to his normal life outside the limelight. However, Donovan receives a mysterious letter from East Germany. The letter leads to the possibility of a “prisoner swap” between Abel and Powers. The CIA, who desperately wants Powers to return to the United States so he won’t divulge any secret information to the Soviets, asks Donovan to travel to Berlin to negotiate the swap. As with Abel’s trial, the CIA believes this must be done by a private citizen, and not by a government official. In 1962, as the Berlin Wall is being built, Donovan undertakes the dangerous secret mission to travel to Berlin to negotiate the swap of prisoners. In addition to these two prisoners, Donovan also learns of Frederic Pryor, an American graduate student captured on the wrong side of the Wall. Donovan wants to try to bring Pryor home as well as Powers. Working with an original screenplay by Matt Charmin, co-written by Joel and Ethan Coen, Spielberg brings this complex story to the screen. The movie looks great, thanks to the photography of Janusz Kaminksi and the production design of Adam Stockhausen, both Oscar winners. Together they reproduce the bustling streets of New York in the 1950’s. But their work really shines when the film shifts to Berlin in 1962. The energy of New York is contrasted to the bleak, grim, cold look of East Berlin. In one of the film’s most memorable and shocking scenes, Donovan and fellow train riders in Berlin watch in horror as a family is shot trying to scale the Wall. The film is richly atmospheric. As Spielberg has done so well so often, he wants us to feel the fear of the Cold War era, in the same way that we felt the hopelessness of the Concentration camps in Schindler’s List and the drama of the battlefields of the Civil War in Lincoln. The climactic scene waiting and hoping that all goes as planned in the prisoner swap on Berlin’s Glienicke Bridge (the Bridge of Spies) is masterful filmmaking. In addition to returning us to the Cold War, Spielberg is also interested in historical figures who do great things amidst the most difficult circumstances. Think of Oscar Shindler, the D-Day soldiers of “Saving Private Ryan,” and Abraham Lincoln. James Donovan is a name that can be added to that list of reluctant Spielberg heroes, who defends the man he calls “the most hated man in America” despite the toll on himself and his family. He also ventures deep behind the Iron Curtain to bring home an American prisoner. Donovan also wants what is best for Abel, with whom he has developed an unlikely friendship. Tom Hanks gives another fine performance as the decent, courageous American lawyer who desires nothing more than to do his work and spend time with his family. But I think the performance that the movie will be remembered for is Mark Rylance as Abel. Rylance is best known for his award winning work on the stage, and, recently for his great performance as Thomas Crowmell in the PBS/BBC series Wolf Hall. Rylance portrays Abel as a quiet but resolute man, who performs his duty for his country. In this he gives Abel an unexpected dignity that belies his “most hated man in America” status. Three times in the movie, Donovan, amazed at Abel’s calm, asks him “Are you worried?” “Would it help if I were?” Abel responds each time, with a slight smile. Rylance could well bring home an Oscar for his performance to go alongside the three Tonys he won for his work on Broadway. The only fault I see in “Bridge of Spies” is that it drags a bit in the second half. At two hours and 20 minutes, I found myself squirming a bit toward the end. Like Lincoln, there’s a lot of talk. Despite this minor flaw, “Bridge of Spies” is an engrossing, beautifully made movie by a master filmmaker.